‘Judge me, please don’t judge me’ is the subtitle of Manuela Ammer’s catalogue essay on the topic of eccentric figuration, which accompanied the exhibition Painting 2.0: Expression in the information age (2015/16) at the Brandhorst Museum. In this essay, Ammer frames a discussion of Nicole Eisenmann’s work around the concept of the painted body as an arbiter that feels—in both senses of the word.1 Within this paradigm, the figure is defamiliarised through abstraction, and materiality becomes an emblem of embodiment. 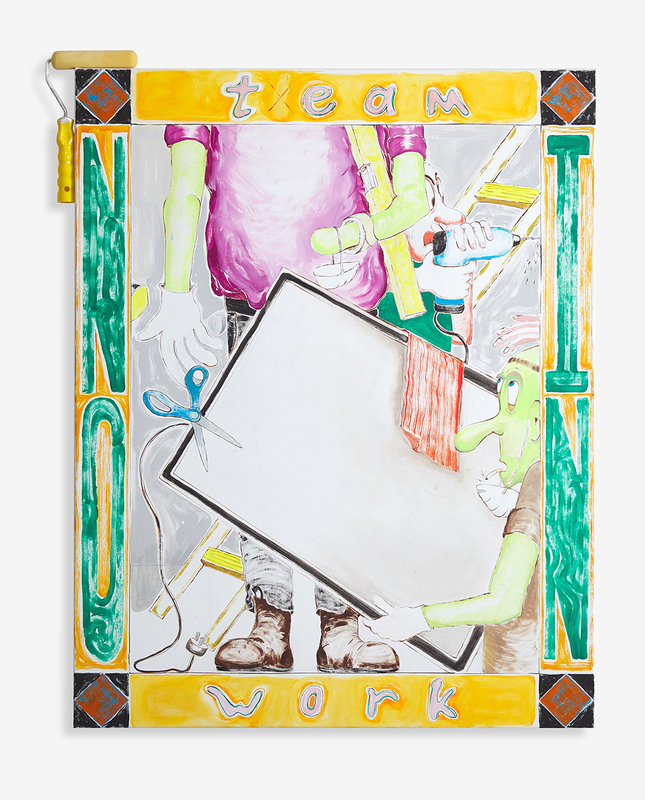 In Chris Dolman’s solo exhibition, Falling from a Broken Ladder, the cartoon body is an existential arbiter: taking stock, measuring, and undergoing various mishaps while working as an exhibition preparator, a job that also demands measuring, appraising and—at least within the paintings—enduring minor accidents (like stepping in paint and other imminent occupational hazards). It’s all fun and games until, or perhaps more accurately when, the ladder breaks. The refrain ‘judge me, please don’t judge me’ points to both the self-possession and attendant angst of painting in the first person. It also extends to the beleaguered characters in Dolman’s artworks. We may openly judge their ineptitude—playing out in both the canvas’s shallow depth of field and the open-plan stage of the gallery floor—but we still understand their plight: this is a labour force that juggles impending deadlines, museum-imposed specifications and precarious incomes. Our sympathies are heightened by the fact that we view the artworks in the meta context of an incomplete exhibition install. In the main exhibition space, we encounter a painting propped up on sanding blocks, waiting to be hung. This, along with other staged, apparently interim arrangements (including patched gallery walls), implicates the viewer in the narrative of the not-quite-finished and the transitional. It is this perspective on the often ill-fated attempts of humans to wrestle with situations larger than themselves that lends Dolman’s works their pathos. While we might look on with exasperation, we know it could be us, given the right (or wrong, as it were) circumstances. In the fiction of painting, unlike politics, the stakes of stupidity are much less worrying. Dolman’s characters, in their anxious vulnerability, are more relatable than reprehensible. As much as we are tempted to pass judgement, we will probably withhold it, because human error is inevitable, and peril, from the ordinary to the ominous, can settle over seemingly innocuous situations and undo even the most experienced of experts. 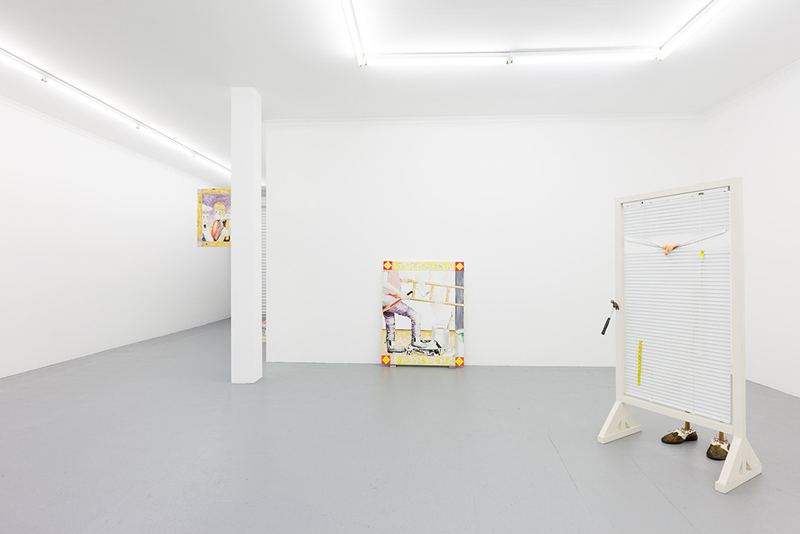 Dolman himself refers to the precariousness that these figures encompass: the impossibly skinny pins of ‘Measuring Legs’ (2019) for instance, which slope forward Kramer-like from canvas-textured plaster shoes, or the paint-roller prosthetics of ‘A Faulty Level Follows You’ (2019), which tilt at an unlikely angle. 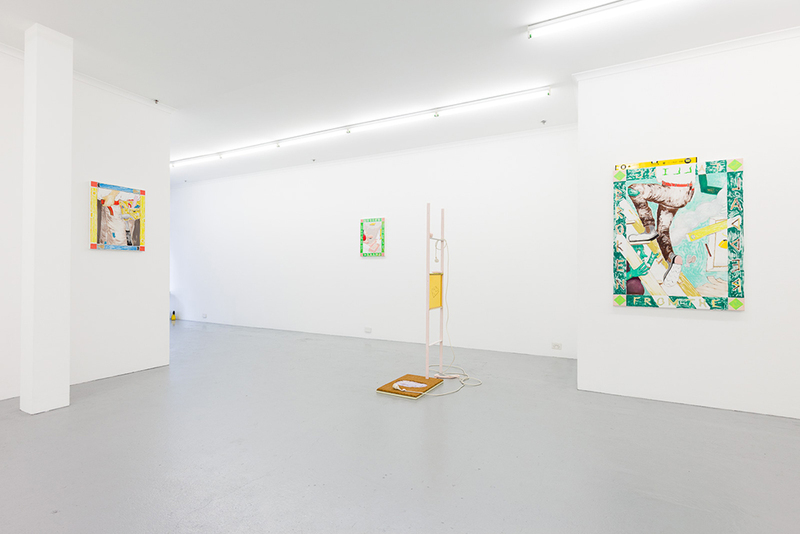 The exhibition Falling from a Broken Ladder invites us to look behind the scenes, to observe the back-side of the artworks, and to bear witness to the infrastructures of the tragicomic. The bold formal attributes of Dolman’s artworks are met squarely with provisional signifiers, shifting the dynamic of the gallery to hover between final presentation and work in progress. The artist’s manoeuvring of both the spatial and emotive contours of the human form belie the makeshift quality of the artwork’s installation in a way that is both witty and precise. Like any art handler worth their salt, Dolman has integrated his vision into a cohesive whole using the tools of the trade, both utilitarian and cerebral.